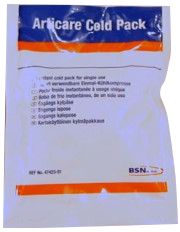 Instant Ice Packs for emergency treatment of sporting injuries. Activated by squeezing the bag. SOLD ONLY IN CARTONS OF 20 Ice Packs. Brand supplied depends on current stock.